Used to monitor temperature (-4 to +140Â°F) and humidity in immediately surrounding environment, EL-WiFi-TH wirelessly transmits data via 802.11b-compliant network to PC. Data can be viewed using supplied graphical software package, and sensor will log readings until able to communicate again with PC application (max 60 days at 10 sec sample interval) if network connectivity is temporarily lost. Unit is powered by rechargeable battery, and range may be increased via Wi-Fi extenders. Pittsford, NY, USA: Saelig Company, Inc. has introduced the EL-WiFi-TH - a WiFi-connected temperature and humidity sensor for monitoring the environment in which it is situated. Data is transmitted wirelessly via a 802.11b-compliant network to a PC and can be viewed using the free graphical software package supplied. The EL-WiFi-TH can be placed anywhere within range of a chosen network. If the sensor should temporarily lose connectivity with the network, it will log readings until it is able to communicate again with the PC application (max 60 days at 10 second sample interval). Additionally, the range of the sensor can be increased by using WiFi extenders. The EL-WiFi-TH is a low-power device that includes a rechargeable internal lithium polymer battery. When configured using typical sampling periods (e.g. once every 60 seconds) the sensor will operate for over one year. The battery can then be recharged via a PC or USB +5V wall adapter using the USB cable provided. The includeded PC software will allow set-up, data logging, and data review for multiple sensors, including immediate graphing of historic data. 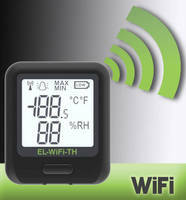 The EL-WiFi-TH features a built-in LCD screen which can display Max & Min readings, Low Battery indication, and WiFi connection strength. With a measurement range from -20 to +60°C (-4 to +140°F), the EL-WiFi-TH is capable of logging more than 500,000 data set entries. The EL-WiFi-TH is suitable for a wide variety of applications, particularly where remote monitoring is important, including environmental and weather monitoring, agricultural and livestock, food & drink, building & site monitoring, and HVAC. The EL-WiFi-TH is supplied complete with wall bracket and micro USB cable from Saelig Company, Inc.